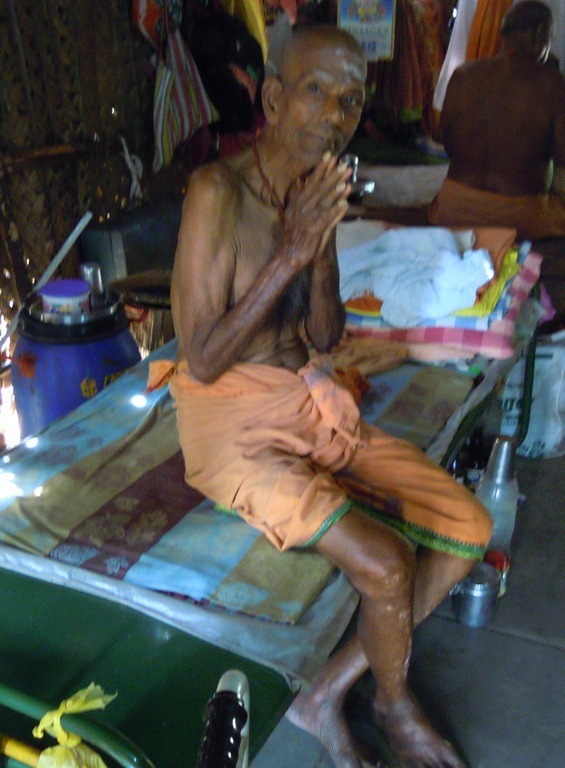 One special part of living with Arunachala is all the sadhus who are attracted to this holy hill. 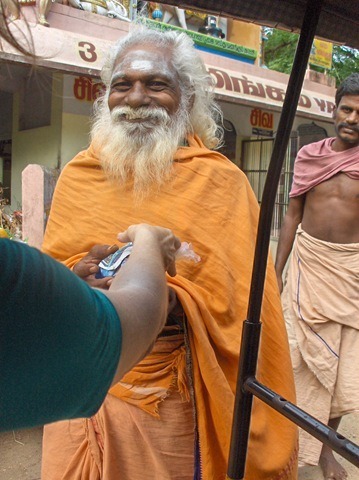 Here is a sadhu receiving food. We have enjoyed their presence here from the first time we visited Tiruvannamalai, and I have written a number of posts about them. This page gives you an easy way to view these posts. Sadhus on the road sometimes seem like they are just waiting for food, for alms, for the day to pass. 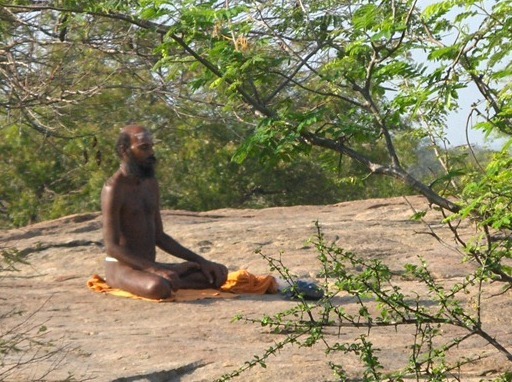 I have walked many times in the forests that surround Arunachala, and often have seen these same sadhus meditating. This section shows articles that feature local sadhus. We have been involved with many sadhu feedings over the years. Articles have been written about a few of these, and are shown here. Below, Carol giving food at our first ever sadhu feeding, done for her birthday in 2008. Many sadhus are old, some very old and needing care. Some are blind or otherwise disabled. Some people make efforts to help. These posts shows some of this. This entry was posted on April 7, 2014 at 11:47 am and is filed under Sadhus. You can follow any responses to this entry through the RSS 2.0 feed. You can leave a response, or trackback from your own site. We met briefly upstairs at Tasty Cafe in the first week of March, 2011. You were there with some visiting friends and I was just at the end of a month in Thiruvannamalai, about to return to Switzerland and then Canada with my wife. I wonder, how much would be the cost in rupees to sponsor such a breakfast as you offer to the sadhus along the pradakshina road; say, once a month?